If there is one thing that gets my board game heart going, it’s a big bag of meeples. I don’t care what shape or what color, hand me a large drawstring bag full of the most iconic image in board gaming and I’m in! Wait wait wait… There is a game with all of that and even more wooden bits? So, little wooden palaces, palm trees, and camels? And it’s published by Days of Wonder?! 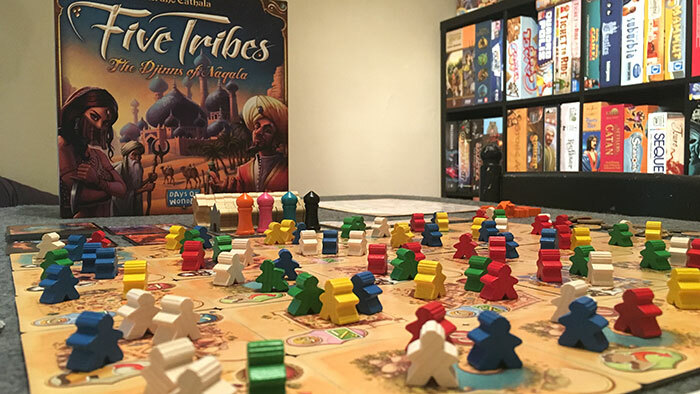 Five tribes is a game of controlling the tribes of Naqala in hopes of becoming the the most influential leader of the legendary city. Set in the 1,001 Nights mythos, it is a game filled with the beautiful imagery of the Tales of the Arabian Nights. 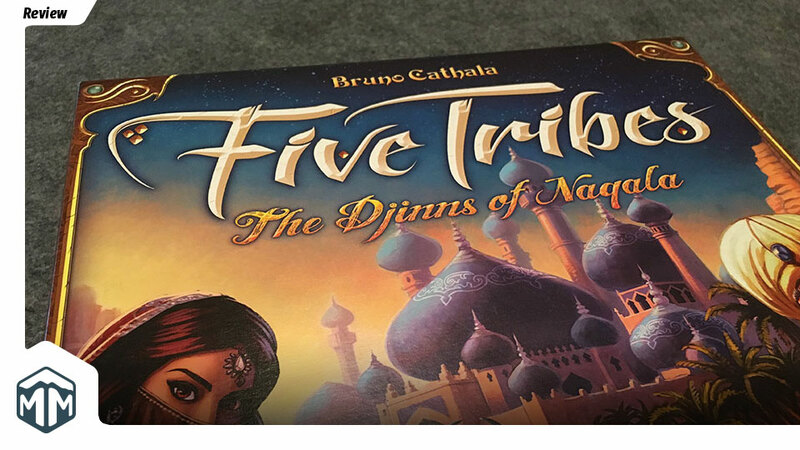 Djinns, camels, palaces, oasis’, and mystical lands are lathered onto Five Tribes to create memorable and beautiful art that will really stick with you. 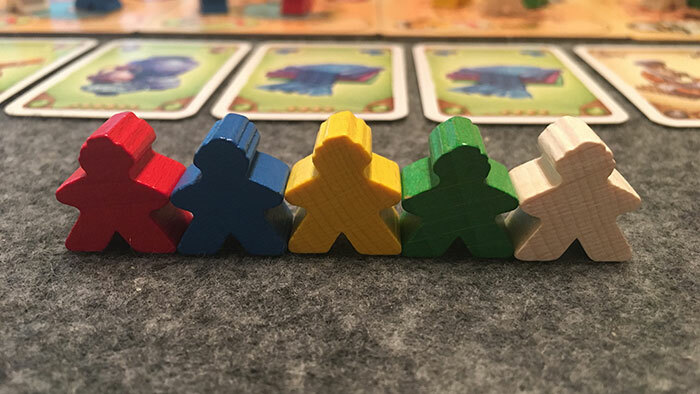 In this game each player will be vying for power through influencing all five different colored meeples that each represent one of the five tribes. Each tribe has a special ability that will give you some sort of power when used. In addition, each of the 30 tiles that make up the board also have a special attribute that will be useful in your attempt for power. Some tiles will even grant you the ability to evoke a special djinn that will grant you even more abilities unique to you. The game plays until there are no legal moves to make or a player has claimed eight different city tiles as his or her own. The player who has gained the most influence by collecting victory points is crowned the Sultan of Naqala and the winner. The game’s “board” consists of 30 tiles randomly distributed into a 5×6 grid. 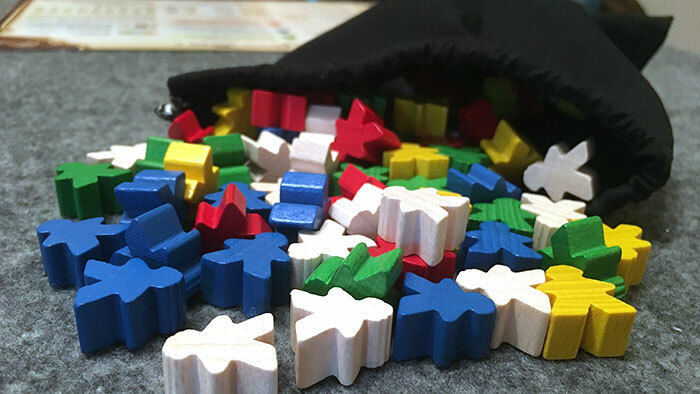 Once the tiles are arranged to create the board, three meeples are distributed to each tile at random from the glorious bag ‘o meeples. Nine resource cards are flipped over in a line on one side of the board to create the market and three djinn cards are flipped over to show the available djinns. Each of the remaining tokens (money/victory points, palm trees, and palaces) should be placed in piles next to the board. 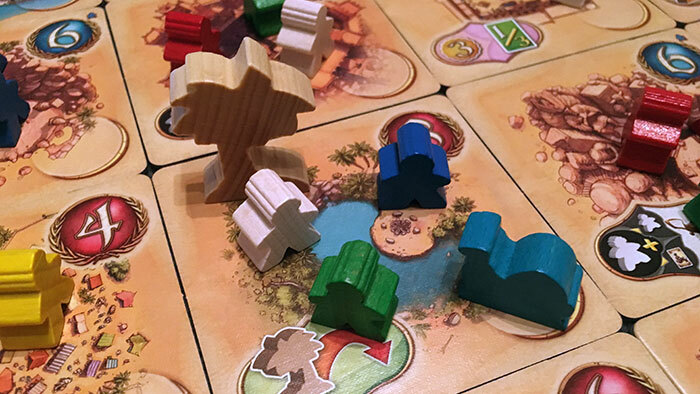 Once the board is set up, each player receives eight camels and 50 coins. You may not immediately backtrack to a tile that you just placed a meeple on. You must place the final meeple on a tile that has at least one meeple of the same color as the one that you are dropping off. Once all of these rules are satisfied, you will take all of the meeples of that color and take their tribe’s action. In addition, if you have completely cleared a tile of meeples, you will gain control of it by placing one of your camels on it. Once you’ve checked for control, you can (and sometimes must) activate the ability of the tile and then end your turn. Pretty simple, right? Move some meeples and take some bonus bonus actions! One of the things that makes this game so great, yet challenging, is how each of the tribes (colored meeples) have different abilities. 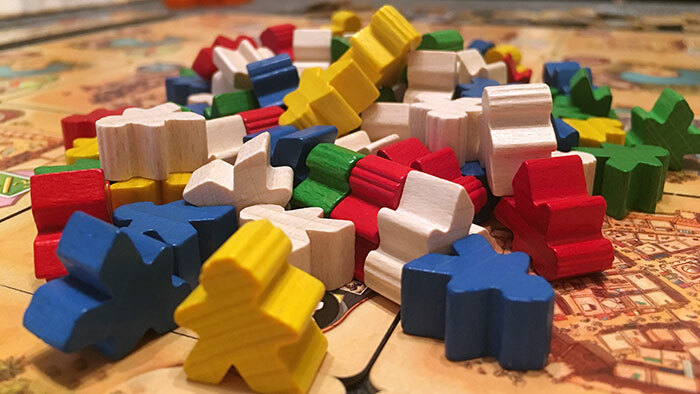 Not only are you trying to maximize the amount of meeples that you can pull from one tile, but you are also trying to maximize the amount of one specific tribe that will benefit you the most. This can be a challenge since there are so many different options available on the board at one time. The Yellow Viziers simply score you victory points at the end of the game. The White Elders score you victory points at the end of the game and are used as a recourse to gain Djinns and/or evoke their powers. The Green Merchants allow you to draw the number of resources from the front of the resource pile equal to the number of green meeples you pick up. The Blue Builders immediately give you money based on the number of blue tiles surrounding the tile your ending tile multiplied by the number of blue meeples you pick up. The Red Assassins kill one other meeple, either from another player’s pool or from a tile adjacent to the tile where the assassins were picked up. Each additional assassin allows you to extend your reach one tile from the starting point. As I mentioned before, once you pick up your meeples from the final tile that you dropped one off on, you will have the opportunity to take one of a few special abilities. The first two mandatory abilities force you to either place an oasis or village token on the tile. These tokens increase the value of the tile for the player who controls it and can be activated multiple times. The second set of abilities are all optional. The small and large market give you the opportunity to pay a certain amount of money to gain a certain number of cards from the recourse market. The “Sacred Places” ability allows you to purchase one of the available Djinns by discarding either two white Elder meeples or one Elder and a special card. All of these abilities will be extremely important in gaining victory points throughout the course of the game. At the end of your turn you are able to sell off resource cards in sets of up to nine. The more cards in a set, the more money you make! There are nine different resource cards, and you can’t include more than one copy of a resource card in a set. Once your turn is up, play continues to pass to the next player until all players have had a turn. After all players have their turn, the resource market and available djinns are refilled and a new round begins. 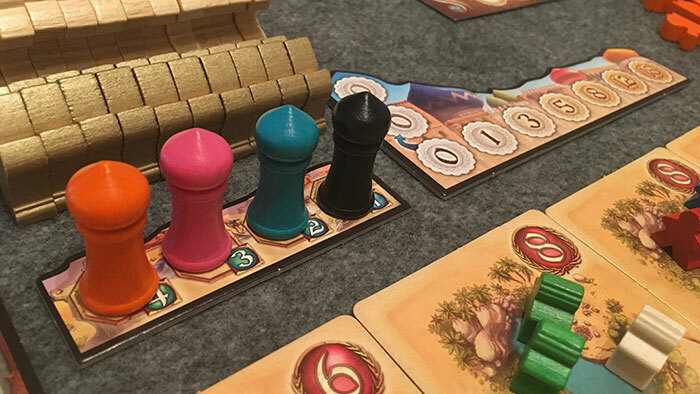 Here comes another genius mechanic from Five Tribes: the turn order auction. You can imagine that a game with so many options available would lead to some that are clearly better than others. Since each player knows that if they do not go first, their plans will most likely be broken, the opportunity to go first is a much sought after bonus. Five Tribes introduces an ingenious mind game to solve this problem. Somewhere near the board will be a player order track. At the end of each round, the players take turns placing their unfortunately shaped towers on the track value that they are willing to pay in hopes to be the first player. This track consists of spaces with costs ranging from 0 to 18. Each player must pay the value that they place their pawn on no matter what, even if the other players choose to pay nothing. This gives some tense moments in the game when someone wants to be first more than anything and must decide if he or she wants to spend a large sum of money to guarantee it, or spend a lesser amount in hopes that no other player will out bid them. I’ve seen people win by aggressively bidding to get the best opportunities, but i’ve also seen people lose by spending too much money on their turn order bids. The challenging decision of deciding whether or not your move is worth more than the 18 coins it takes to guarantee the first turn makes for such an intense first player selection. I’m not sure if i’ve ever spent so much time talking about a small mechanic like turn selection, but this system is the icing on the cake to such a well designed game. Clearly I enjoy this game. Its tough decisions undoubtedly make you think hard each turn, yet the ever changing nature of the board forces you to constantly think on your feet as your turn approaches. Though I love this kind of depth, I know that it is not for everyone. The amount of choices and variety that Five Tribes offers is both its biggest strength and also its biggest weakness. For some players, the sometimes overwhelming amount of choices available will either turn them off or cause them to have substantial analysis paralysis. My general philosophy when playing is to go with my gut instinct in order to keep myself from spending too much time deliberating my move. Still, many players will not see this as an option and may take more time than preferred. If a good game is made up of lots of challenging decisions (and I believe it is), then Five Tribes hits the nail on the head. Just in a player’s move, they have to find the best tile to pick up from, the best tile ability to land on, and the most optimal color meeple to drop off on that tile. Furthermore, the tense player order auction takes a mechanic that is mundane in most games and allows it to shine as a pivotal game mechanic. 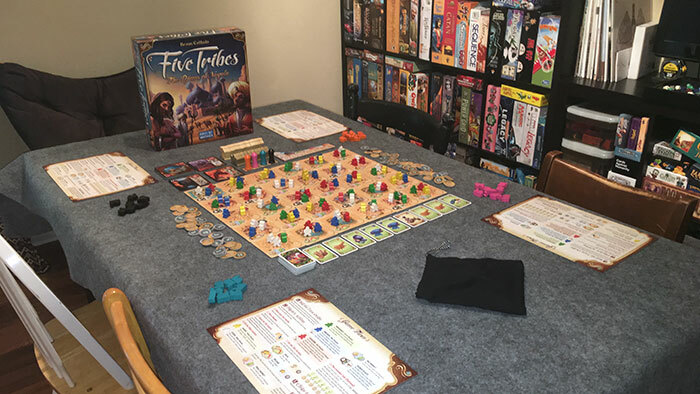 The fact that Five Tribes was published by Days of Wonder gave me confidence in it to know that it would be great, even before I cracked open the box. DoW is a publisher that is known for a few signature qualities in their games. Two of the most prolific signature qualities are their quality of art and components; and their tendency to publish games that are both deep enough for gamers, and yet easy enough for families to pick up. Not only are these two staple parts of their games, but they generally only publish one new title each year. It seems they take the approach of quality over quantity and Five Tribes is no exception. The first of those two qualities I mentioned is art and components. 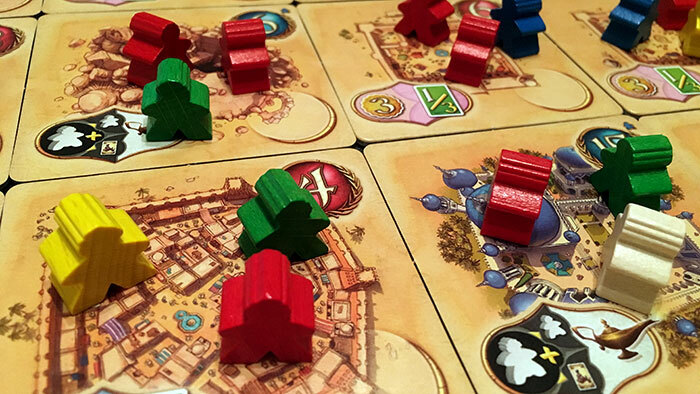 Five tribes follows suit from past Days of Wonder games with lots of colorful and hefty pieces. There is a huge bag of wooden meeples (oh man….) in addition to the lot of thick wooden camels, palm trees, palaces, and start player pawns. Everything is just as colorful as the majestic world it is set in. Not only do the bits look great, the art on the tiles and cards are equally attractive. Clement Masson did a fantastic job of displaying the mythos of 1,001 Nights in a way that is both colorful, mystical, and attractive. The second quality I mentioned is their ability to publish games that are both easy to learn but also deep and challenging to master. Having games that can be pulled out with a mixture of “gamer” and “non-gamer” friends are invaluable in a collection. This is one aspect where Days of Wonder stretched a little bit. This is certainly on the more complicated side of their line up. Though I don’t think that Five Tribes is an extremely complicated game on its own, compared to other DoW games like Ticket to Ride, but it does lean more towards the complicated side of the spectrum. I don’t think this is a bad thing. In fact, i’m glad that they took the opportunity to publish a game that was a little bit out of their comfort zone. Still, I have taught this game to some less experienced gamers and they still loved it! 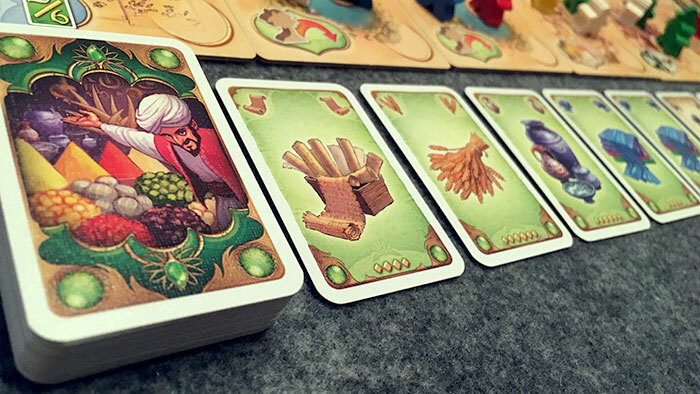 Five tribes is a game with endless replayability. It’s a game that feels fresh and new each and every time it is played due to its changing board and meeple placement. It’s a game for people who love lots of wooden bits and interesting decisions. It’s also a game that could easily turn people off due to its sometimes overwhelming number of options available. It’s a game that has a permanent spot in my collection and I recommend it to almost everyone even slightly interested in games. It’s a game that you should certainly give a shot! What do you think about Five Tribes? Give us your opinions about what you like and/or dislike about the game in the comments below!